If you desire to have a good time on your trip through Sibiu then Flying Time is the location to be. Besides a hostel, Flying Time means a Cafe, a restaurant and Old Pub making this spot a real fun home. We are also situated within the old center of the town so we are inside walking distance of all of the main points of interest of Sibiu. 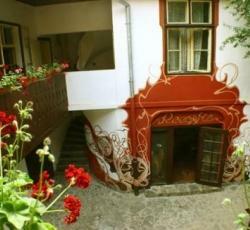 Great location - right near "Piata Mare"; superb and fabulous common areas (both inside the hostel and in an inner courtyard); helpful employees The hostel is also a gathering spot for locals, and at the time of ARTMania festival there was a very nice party atmosphere. The decor and environment is super cool with an opium den looking lounge and lots of space to hang out and meet other travelers. The private double was great and I really liked the ensuite bathroom. The decor and environment is super cool with an opium den looking lounge and lots of space to hang out and meet other travelers. The private double was wonderful and I really liked the ensuite bathroom. Bar and restaurant at ground floor, receptionist is the bar tender. great for party young people. Very cool look to this hostel with some exciting furniture. Has a big, nicely equiped kitchen. Really very good location, only three mins walk from Piata Mare. This hostel is simply great: perfect location, great atmosphere (it's one of the most beuatiful hostels I have seen in all my life, and I am not so young), lots of services, and it also is problably the cooler pub in the whole town. I would recommend it any time and if I ever come back to Sibiu I will choose Flying TIme happily. * Flying Time rated 4.33 out of 5 based on 9 customer reviews. Hostel reviews with a star rating are sourced from HostelBookers. If you find Flying Time with the same booking conditions at a lower rate somewhere else on the internet after you have booked, we will refund you the total difference.